Accepta 8701 is a high performance, industrial grade secondary refrigerant antifreeze coolant, based on ethylene glycol blended with BS6580 proven corrosion, scale and biological inhibitors. 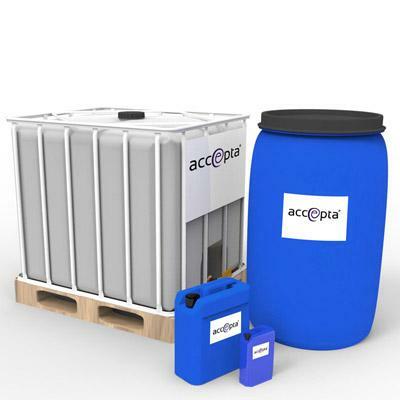 Accepta 8701 has been especially formulated from ethylene glycol for use as an industrial grade secondary refrigerant antifreeze in process cooling, refrigeration and air conditioning systems, where toxicity is not an issue. Accepta 8701 contains synergistic corrosion inhibitors to protect metals commonly found in such systems. Accepta 8701 is based on hi-grade mono ethylene glycol coolant and offers excellent frost protection characteristics. A tracer dye can be added to Accepta 8701 allowing it to act as a leak detector. A bitter taste additive also can also be added to Accepta 8701 to prevent human consumption. Accepta 8701 has been tested in accordance with BS5117 and found to meet BS6580 corrosion standards for mild and stainless steel, aluminium, copper, brass and cast iron. Zinc or galvanised components are not recommended for use with closed loop cooling or heating systems. As per BSRIA guide AG 1/2001.1 all pipe-work systems should be clean and free from biological contamination prior to commissioning. To minimise corrosion air* ingress and exposure should be minimised. A pressurised system is best. Determine the total system volume and add Accepta 8701 to the system according to the minimum operating temperature required (see table). The minimum dose should not be less than 25% of the system volume and the maximum does not normally exceed 60%. We recommend the use of deionised, distilled or UltraPure water for this dilution. Avoid water containing high levels of calcium salt s or Chlorides [Cl–]. *Oxygen feeds the corrosion process which consumes inhibitors. When measuring the percentage of Accepta 8701 coolant in the system use an Accepta refractometer.